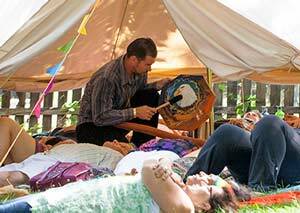 Sean is an author, musician, composer, energy medicine practitioner and qualified educator, having completed formal academic studies in Arts and Education at the University of Queensland. He has also undertaken studies in Oriental Therapies and Massage with the Australian Institute of Applied Sciences and Evolve College (formerly the Australian College of Massage). Sean was drawn to the sacred Inca shamanic self-healing journey – the “Medicine Wheel” – in 2012 and is recognized as a gifted healer and educator, blending the wisdom teachings of the Inca shamanic tradition with those of Traditional Chinese philosophy and the energies of Indigenous Australia. As a full Mesa carrier, Sean now works closely with quantum universal light and sound frequencies, sacred cosmic codes and geometries that form the foundation organising principles of matter and energy.